(Black-eyed Susan, Hairy (Rudbeckia hirta) - 01) We have added the name "Hairy" to this species of black-eyed Susan, to help distinguish it from the smoother, non-hairy species (Rudbeckia serotina); however, the literature does not make this distinction in the common name (Black-eyed Susan). The literature says that the leaves of this species are ovate rather then linear-lanceolate, but the differences are not as pronounced as the description might imply. 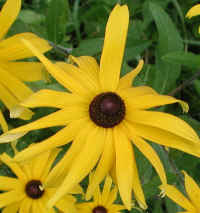 (Black-eyed Susan, Hairy (Rudbeckia hirta) - 02) The bright yellow ray flowers of the black-eyed Susan surround the dark brown disk flowers. 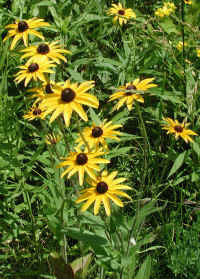 (Black-eyed Susan, Hairy (Rudbeckia hirta) - 02a) Here is another look at this patch of black-eyed Susan. 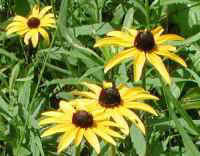 Black-eyed Susan bloom from June to October. They are originally a native of the Midwestern United States, but are now found throughout. 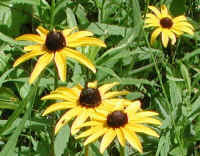 (Black-eyed Susan, Hairy (Rudbeckia hirta) - 03) This is another patch of black-eyed Susan, which can grow to heights of three feet, particularly where they are competing with other plants for sunlight. 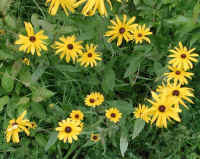 (Black-eyed Susan, Hairy (Rudbeckia hirta) - 04) We have found that the diameter of the black-eyed Susan flower heads vary considerably in size, as this photo shows. (Black-eyed Susan, Hairy (Rudbeckia hirta) - 04a) This is a closer look at the large black-eyed Susan from the previous photo. (Black-eyed Susan, Hairy (Rudbeckia hirta) - 05) In this photo we can see how the leaves of the black-eyed Susan grow alternately along the stem. (Black-eyed Susan, Hairy (Rudbeckia hirta) - 06) In addition to observing this black-eyed Susan flower head, we can also see the hairy stems and hairy underside of a small leaf. 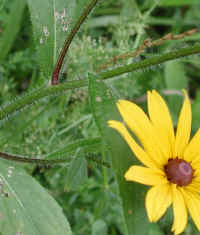 (Black-eyed Susan, Hairy (Rudbeckia hirta) - 06a) In this photo we can see more of the hairy stems and leaves of the black-eyed Susan. 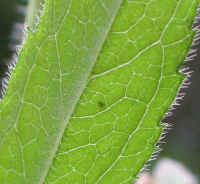 (Black-eyed Susan, Hairy (Rudbeckia hirta) - 07) In this photo we have a close up look at the leaf hairs of the black-eyed Susan. 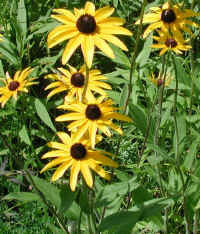 (Black-eyed Susan, Hairy (Rudbeckia hirta) - 08) Ruth Sano sent us this and the next four photos of a mutated hairy black-eyed Susan. Neither she nor we had ever seen anything like it before. 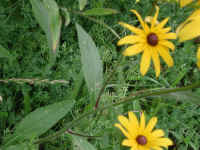 (Black-eyed Susan, Hairy (Rudbeckia hirta) - 08a) Ruth Sano sent us this photo of a mutated hairy black-eyed Susan. In this photo we have a closer look at the flower and the hairy stem and leaves. 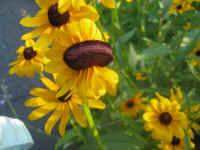 (Black-eyed Susan, Hairy (Rudbeckia hirta) - 09) Ruth Sano sent us this photo of a mutated hairy black-eyed Susan. 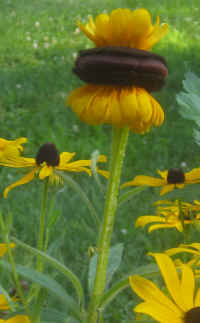 (Black-eyed Susan, Hairy (Rudbeckia hirta) - 10) Ruth Sano sent us this photo of a mutated hairy black-eyed Susan. 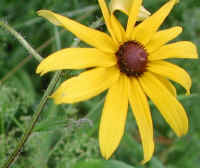 (Black-eyed Susan, Hairy (Rudbeckia hirta) - 11) Ruth Sano sent us this photo of a mutated hairy black-eyed Susan.